girl pays more attention to salad than hot runner. Being that it was so beautiful out yesterday and I had an hour to kill before my hair appointment, I decided to grab lunch and head to the park downtown and eat outside. It was a great place to people watch. Lot's of lawyers taking their brisk lunch walk in their white tennis shoes and office wear, tourists fresh off the bus, children playing joyously after being stuck indoors for a week due to the rain. Lot's of runners and mommies with strollers. An ideal setting to sit and enjoy my lunch and get a little sun. 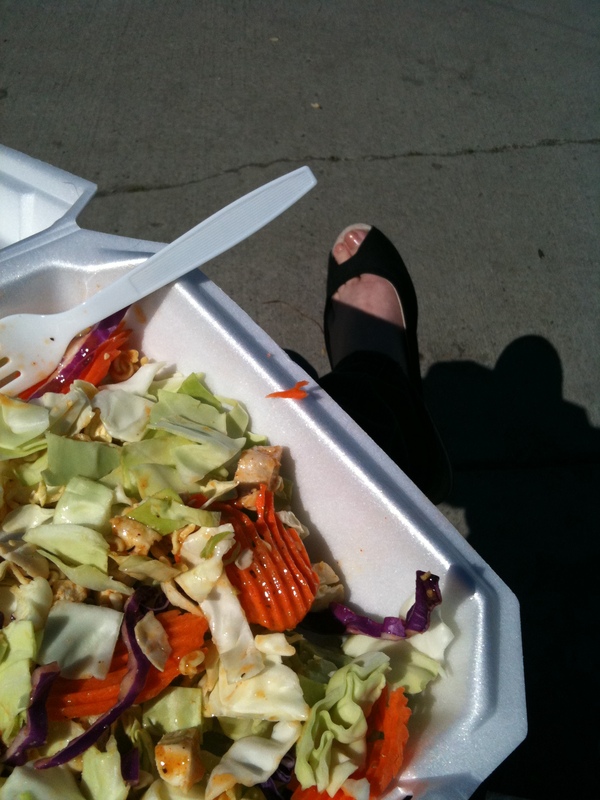 As I drench my fresh asian salad (which I had been looking forward to all morning) with rice wine vinaigrette, I overheard a few women whispering on the park bench next me. I noticed in my peripherals a bare chested, ultra tan runner coming our way. Pre-pregnancy me: would coyly look up and maybe give a smile. Pregnant me: too interested in getting the first bite of salad in my mouth to look up and admire.